I remember the woman well. She was in her mid-twenties. She wanted an abortion, and did not want anyone or anything to interfere with her plan. She had arrived at the abortion facility that morning with a young man whom I later learned was her boyfriend…and the father of the child whom she came to kill. As the two of them walked from their car to the abortion facility I told them that we would help them with both financial and emotional support. I reminded them that her child was alive and needed their protection. I asked them to reconsider because there would be no undoing what they were about to do. The young woman shouted to me. “Mind your own business.” It was, she complained, not my right to judge or to interfere in her life. No amount of offers of help or of pleading for the life of the child could change her mind. She was dead set on death. When the father of the child came out to make a call on his cell phone I learned then that the young woman was about twelve to thirteen weeks pregnant. He was not in favor of the abortion, but was there to support her in her decision. Her family was not pressuring her to have the abortion, he said, but she was upset and fearful of giving birth to the child. Many of the abortions at that particular facility, and probably at many others, are done around the the twelfth week of pregnancy. At that stage it is easier to pretend that there is no living being in the womb. The pregnancy is an abstraction instead of a person. But our state law now requires that the abortion seeker have a sonogram before making a final decision to kill her unborn child. If the woman will actually look at the the image of a living being in the womb, abstraction and pretend can change to reality and person. The incident with the woman denying the existence of her baby came to mind a few weeks ago. Vividly. My daughter emailed me a copy of the image captured when she had a sonogram at about her tenth week of pregnancy. When I opened the attachment to her email, I saw the image of my living grandchild. A very small human being, but a very human being nonetheless. 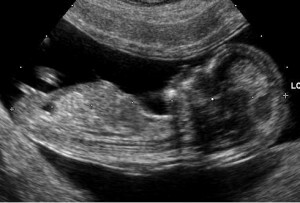 Through the miracle of the sonogram I was allowed to eavesdrop on the very real living child in the womb. However, the joy of looking at my grandchild in his or her tenth week was tempered with another fact. I was seized with sadness at the thought of how many hundreds of unborn children in their tenth or twelfth or fifteenth week of life, whose human image on a sonogram would be no less real than the image of the child of my daughter and son in law, had been carried right before my eyes into the abortuary, to be dismembered and killed, and thrown out like garbage. But there is good news. The young mother and father at the abortion facility that day quit pretending, and admitted that she was indeed with child. They decided to love and not to kill, and went home together…all three of them.